Gorgeous day down at the docks, oops, waterfront. Locking my bike, I read that UCS won't be remotely to blame if it ain't there when I get back. Like Smiffy's mate, George Michael, you gotta have faith. Ian Fletcher from BBC's 2012 -- I mean Andy from BT's Grassroutes -- is already at the counter, Brompton in tow. 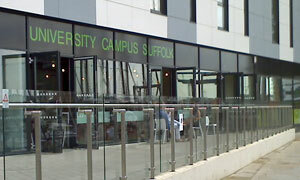 To cut a long story short, we're in Theta, the ground floor cafe at the base of the flash University Campus Suffolk building. Not sure what happened to Couture, the posh brasserie opened by Tony Hadley, though I'd guess they didn't strike gold. Inside there's red & white plastic chairs & tables by the score. Normally they'd have other tables outside but apparently they're on loan to Kai, the UCS bar along the quay. No matter, we'll drag some seating out into the sun. In keeping with Wicked, their underwhelming eatery upstairs, you're in luck if you'd like to test your knowledge of the Ginster's product range. Them thar students can also go for an Urban Eats prepacked sarnie. Thankfully, before we all head back to Greggs, I see that they also make baguettes to order. Ten-inch brown, please, with tuna mayo. Sorry, only seven-inch white. Er, I guess that'll do, thanks. Handmade and on a plate, good. Not a hint of a leaf or a crisp, less good. Drinks-wise, it's apple or OJ, else it's the vending machine over there. Oasis fruit punch for £1.20 is a reasonable price. Outside on the patio-type raised area, life is good and the vista of bobbing boats is quite something. For once, nobody's in a hurry. Well, maybe that pair of joggers. Inside, if your brain needs feeding, there's artwork by John Fazakerley et al. Chocolate tiffin slice wasn't the wisest option under a fiercely beating sun. Asked for a straight coffee: glad we weren't kettled. If it was a car -- Lancia Theta. If they were passing by -- Gary Kemp.